Employee computer monitoring tool is entirely stealthy in its operation. The tool or its agent will not be visible in the Start menu, Control panel, Task Manager, or anywhere else. So, employees will not be aware of its installation or desktop monitoring. Employee computer monitoring software offers uninterrupted surveillance. It automatically starts monitoring activities right from the moment an employee’s system starts. The monitoring remains uninterrupted even if the employee restarts the system. There is no limitation to the number of computers that you can monitor with this tool. 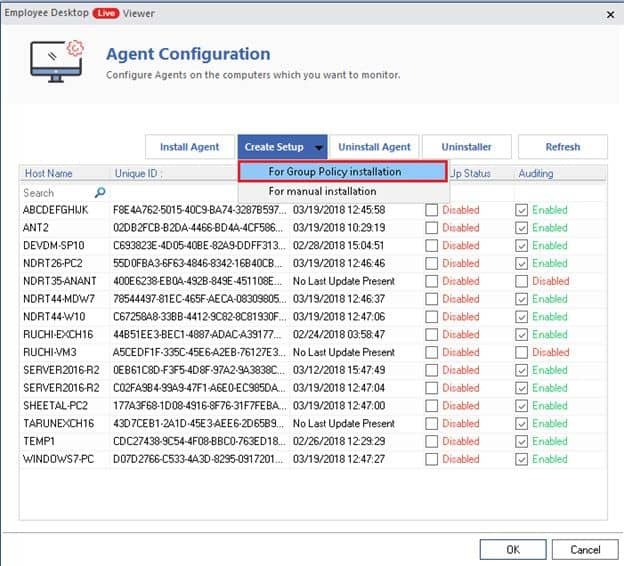 The agents can be installed on any number of computers (in the same domain, different domain, or workgroup) simultaneously and all ongoing activities on these systems can be monitored on a single viewer screen. Due to the recording feature of the Employee Desktop Monitoring tool, it is not necessary for you to be there always in front of the system to do the monitoring. Even if you are offline, the monitoring will continue uninterrupted, and you can access the recorded videos anytime you like. With this Desktop Monitoring tool, you can monitor employee desktop activities in different geographical locations. So, this is an ideal tool for enterprises with offices in different geographic areas. The Kernel monitoring tool facilitates dual-screen monitoring. So, even if the employee is working on two monitors, you can monitor them. With this tool, you can also monitor floating devices like laptops. Though the tool does not allow to make changes to the data on employee desktops, you can turn off, restart, or shut-down the computer. If required, you can send an instant warning message to the employee. The Viewer console of the tool is a standalone application that can be installed on any system. The admin user can delegate viewing rights (of all computers or selected computers) to other users. And the Viewer application can be installed on floating laptops too. The Employee Desktop Monitoring tool has the option to display popup messages on all the computers under surveillance. You can show this pop-up message at desired intervals with the default text or with a note written by you. Adding computers for monitoring is quite easy with this tool. You can manually browse and add computers, add them by providing IP (IP range for multiple computers), or add them using a CSV file with the IP addresses. 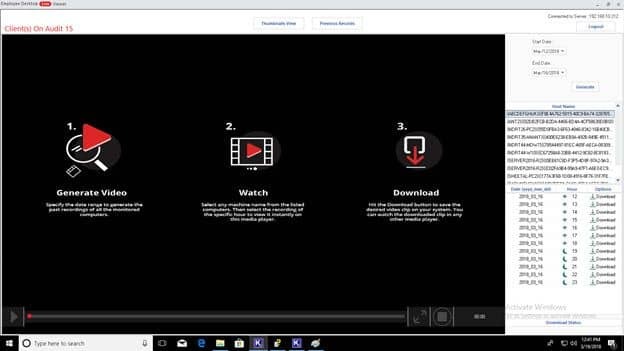 The tool provides a set of advanced settings options to specify the Recording Location, Video Retention Settings, Picture Quality Settings, Pop Up Notification Settings, etc. So, you can perform monitoring as per your needs. Why should you use Employee monitoring software? Boosts Productivity Keeping an eye on employee desktop activities on working hours and identifying careless, idle workers from the lot would prevent wastage of working hours for sure. Ensures Security The complete knowledge of how resources and data are being used, which you get through the monitoring software, ensures data security eliminates the risks of data compromises. Increases Sense of Responsibility Employees, when they are aware of being monitored regularly, could develop a sense of responsibility and discipline, which in turn improves their productivity and overall business profits. Early Risk Detection While keeping an eye on the crucial tasks, the management can suggest some corrections or advise employees in time to avoid errors and achieve more accuracy. Works everywhere (works on systems located in different geographical locations). Computer Monitoring software allows you to monitor employee computer activities, record them, and view them when required. Step 1Configure monitoring on employee desktops. 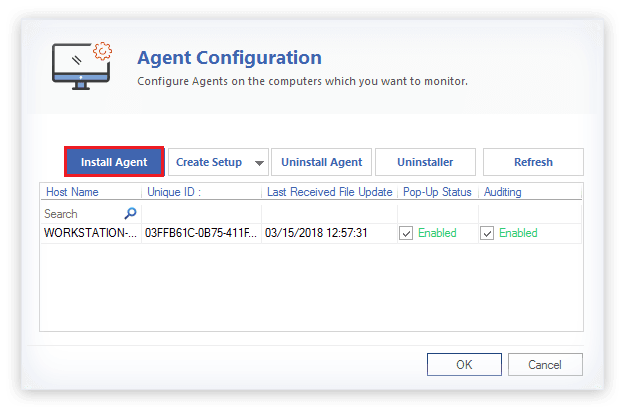 Step 2Install agents on computers to be monitored. Is there any chance that user gets to know about being monitored? What if I am not available to monitor live activities of my users? 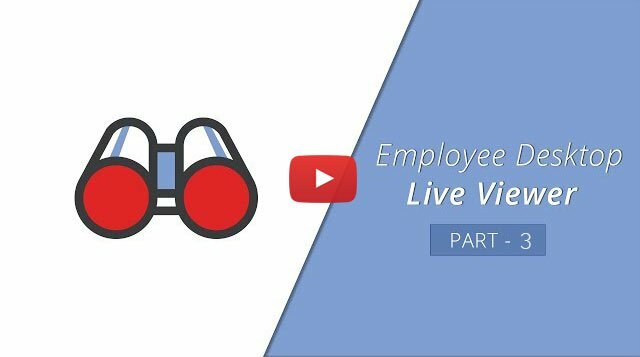 You need not be available to monitor live activities of employees. The software records all the activities and you can watch the videos (AVI format) later as per your convenience. Do I get Technical Support for the product? Yes, Support and Maintenance are free for lifetime. What are the limitations of the Free trial version? The Free trial version of the tool allows you to monitor computers for a period of 7 days. You can use the trial to test all the features and functionality before purchasing the application. Does the software allow monitoring of several computers at the same time? Yes. You can monitor as many computer systems as you want at the same time, and you can view activities of all the computers on a single screen or you can also view them individually. Whether they are in a workgroup, in the same domain, in different domain, or in a different office in a different geographical location. You can monitor even floating laptops too. Does Employee Computer Monitoring software work in a single area network? No. Our tool works in a variety of available networks like LAN-WAN, WAN-LAN, and WAN-WAN etc. it easily monitors your employees from a remote network with the help of Global IP address. Does Employee Desktop Live Viewer software allow dual-screen monitoring of a single computer? Yes. 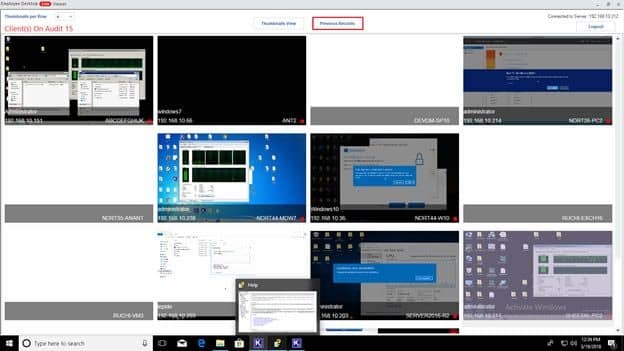 If a user has opened two different windows for different tasks, you can actually monitor both windows on a single computer. Can an administrator make changes to employee’s computer? 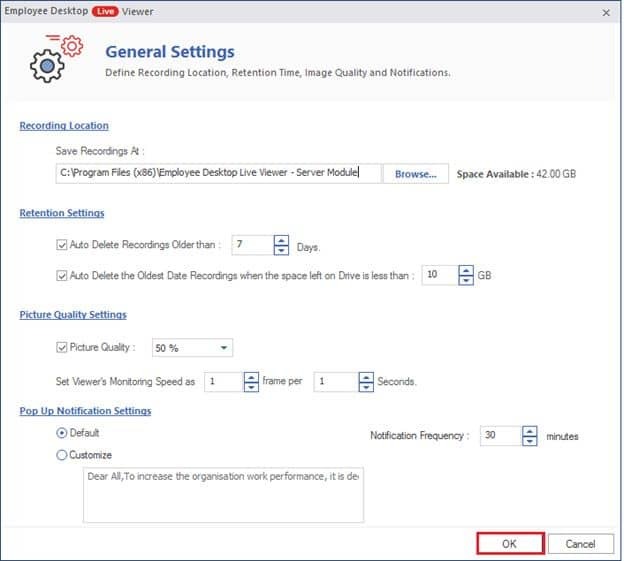 Employee Desktop Monitoring tool does not allow to make changes in the data used by the employee. But an administrator can turn-off, restart, or shutdown the computer. Moreover, he can send a short warning message to the employee. It helped me to find some malicious attempts on the computer immediately. Thus, we could avoid some unwanted situations. Now I can assist my employees to be more productive and complete the project at the right time. "After I found this tool all the issues are sorted now." 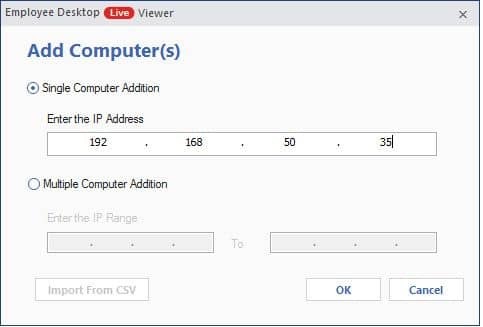 Input IP address to Add single computer. 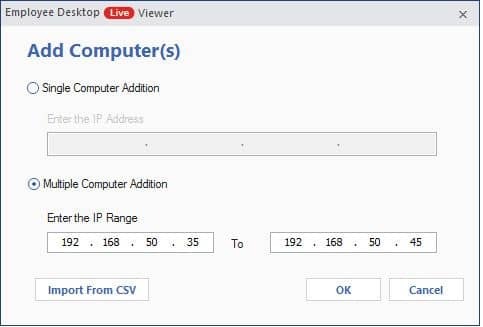 Input IP range for multiple computer addition or import IP range using CSV file. 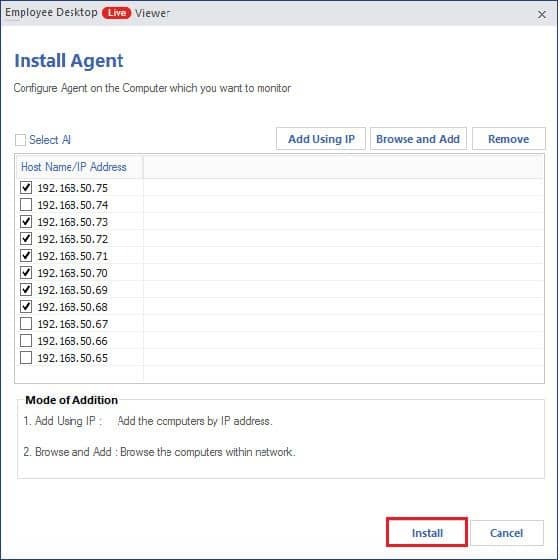 Select number of IP addresses where you want to install the agent and click Install. Use Group Policy to install agents on computers. Employee Desktop Live Viewer v18.4 has been released. In this version, the user experience has improved a lot. 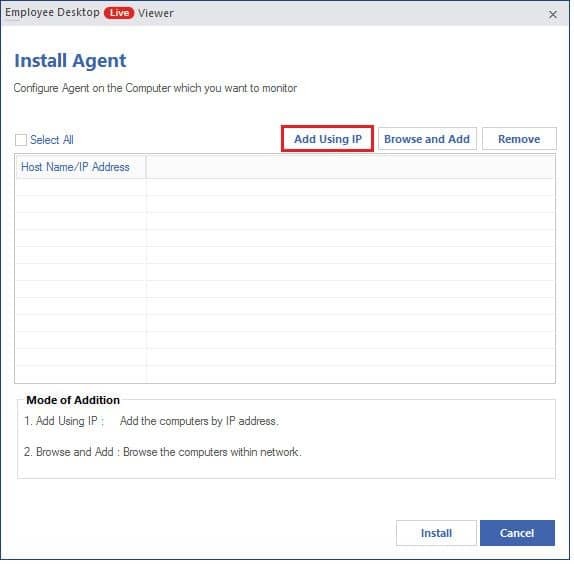 Now the tool has individual options for installing agents in Work Group and Domain. The new version of the tool works more efficiently after many performance improvements and some bug fixes. Employee Desktop Live Viewer version 18.1 has been released. Now you can monitor the desk activities of your organization’s employees with more features. The tool can monitor the systems in the same domain, different domain, or workgroups. Also, you can download the recorded video (.avi format) of their previous activities based on a date range. To lower the burden of monitoring a large number of systems, you can create multiple Admin accounts and delegate specific monitoring tasks. Even remote users can be assigned with the task of monitoring. The company announces the launch of Employee Desktop Live Viewer Version 13.02.01. The updated version of software now supports Windows 8 and very much capable of recording user activities and saving in .AVI file format. 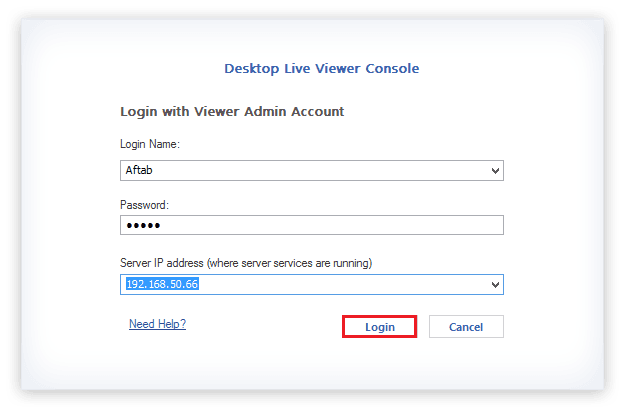 The new version of Employee Desktop Live Viewer (Version 12.01.01) comes with enhanced capabilities to optimize the desktop monitoring experience. 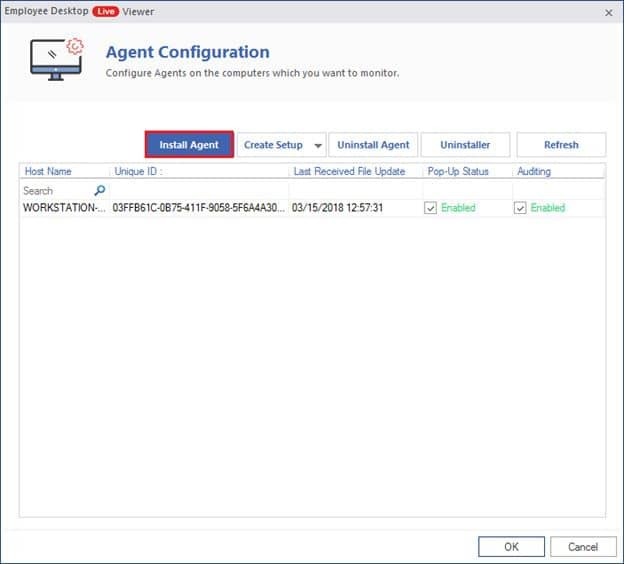 EDLV version 12.01.01 now enables more precise offline recording and faster agent detection during manual installation of the Agent executable file. Minor issues present in the previous version have also been resolved in the updated version of the software. 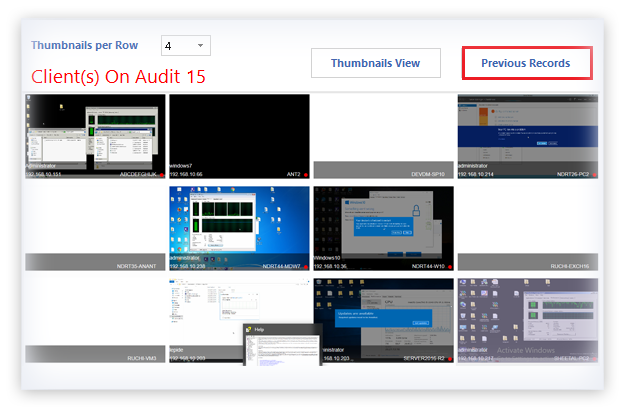 Improved version of Employee Desktop Live Viewer launched today. The new improved version is now embedded with some exclusive features like, dual screen monitoring, speedy monitoring ofWindows7 based systems and 5 minutes movie making facility in demo. With these additional features, software users can make employee monitoring more effective. Updated version 10.02.02 of Employee Desktop Live Viewer has been launched today. 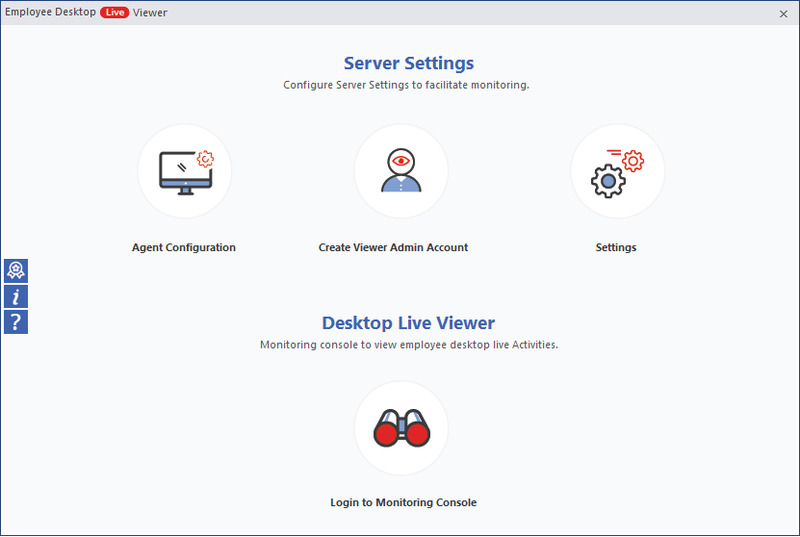 The updated version of Employee Desktop Live Viewer with minor bug fixes is now available to provide users with exclusive benefits through efficient and effective employee desktop monitoring. Updated version of Employee Desktop Live Viewer-10.02.01 with minor bug fixes for effective monitoring of employee desktop activities from a centralized location. Nucleus Data Recovery.Com, providers of the excellent enterprise level software, announces the launch of Employee Desktop Live Viewer software. The software to monitor many employee computer(s) at once is available now to cater Organizational needs to track and monitor every activity of the employees.